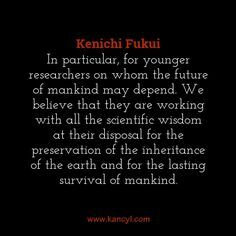 Kenichi Fukui was bornon October 04, 1918 in Nara City, Japan, Japanese, is Chemist. 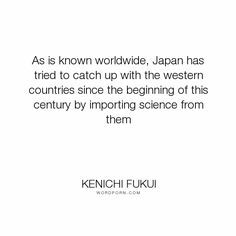 Kenichi Fukui was a Japanese theoretical chemist. 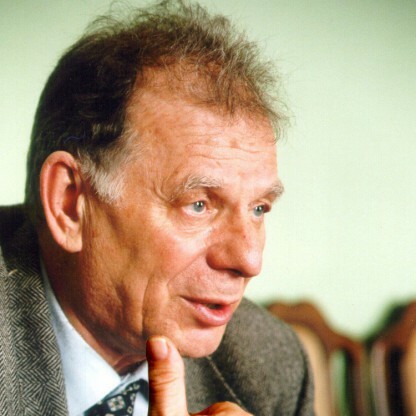 He was joint recipient of the 1981 Nobel Prize in Chemistry. 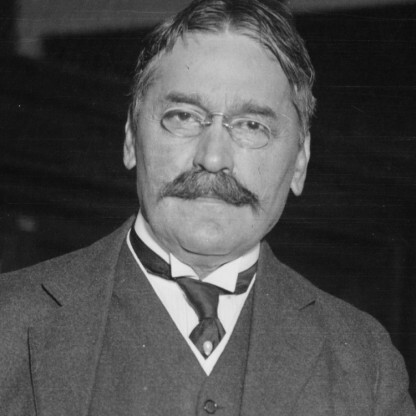 His works helped in reducing the gap between practical chemistry and physics and mathematical theories that influence the behavior of atoms and molecules. After completing his graduation in Industrial Chemistry from Kyoto Imperial University, he began his career at the Army Fuel Laboratory in Japan. Later, in 1943 he joined the Kyoto Imperial University where he worked until 1982. 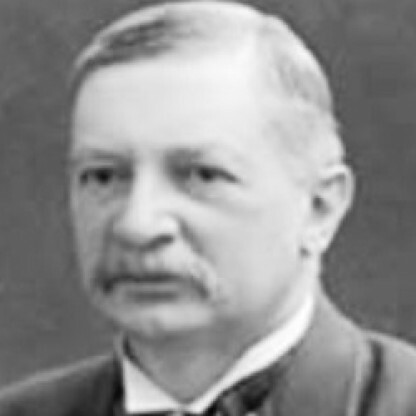 He then served as the President of the Kyoto Institute of Technology after which he took up the position of Director at the Institute for Fundamental Chemistry. 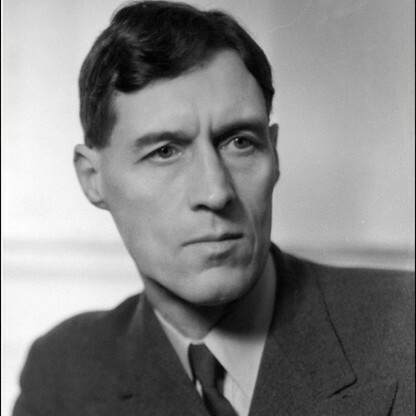 In 1952 he presented the molecular orbital theory of reactivity. 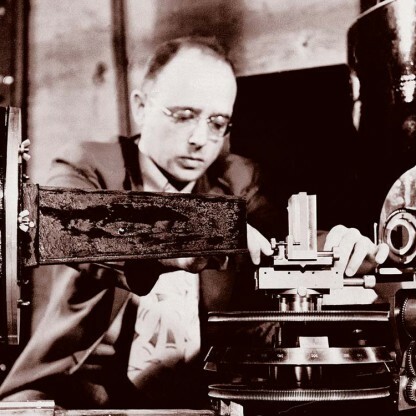 He also coined the term ‘frontier orbitals’. Though the theory was initially criticized, it was later accepted by scientists and his theory assisted in the better understanding of the process on chemical reactions in the formation of organic compounds. Kenichi Fukui was known to use complex mathematics to support his studies and research. He was the first scientist from Japan to win a Nobel Prize in Chemistry. 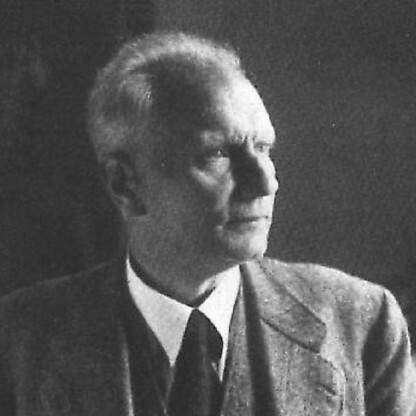 He authored numerous articles in Japanese and English on topics related to chemical relations, experimental organic chemistry, organic synthesis by inorganic salts, catalytic engineering, catalysts, polymerization kinetics, and the statistical theory of gelation. 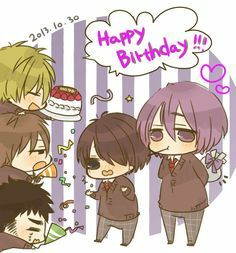 Fukui was the eldest of three sons of Ryokichi Fukui, a foreign trade merchant, and Chie Fukui. He was born in Nara, Japan. In his student days between 1938 and 1941, Fukui&apos;s interest was stimulated by quantum mechanics and Erwin Schrödinger&apos;s famous equation. He also had developed the belief that a breakthrough in science occurs through the unexpected fusion of remotely related fields. On the advice of Kita, a personal friend of the elder Fukui, young Kenichi was directed to the Department of Industrial Chemistry, with which Kita was then affiliated. 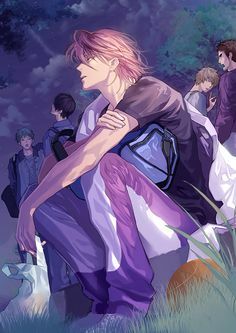 He also explains that chemistry was difficult to him because it seemed to require memorization to learn it, and that he preferred more logical character in chemistry. 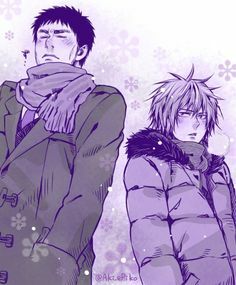 He followed the advice a mentor that was well respected by Kenichi himself and never looked back. He also followed in those footsteps by attending Kyoto University in Japan. During that same interview Kenichi also discussed his reason for preferring more theoretical chemistry rather than experimental chemistry. Although he certainly acceded at theoretical science he actually spent much of his early research on experimental. Kenichi had quickly completed more than 100 experimental projects and papers, and he rather enjoyed the experimental phenomena of chemistry. 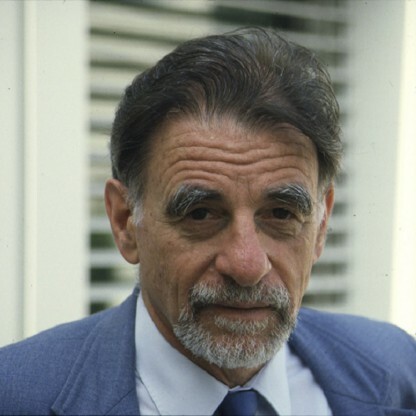 In fact, later on when teaching he would recommend experimental thesis projects for his students to balance them out, theoretical science came more natural to students, but by suggesting or assigning experimental projects his students could understand the concept of both, as all scientist should. Following his graduation from Kyoto Imperial University in 1941, Fukui was engaged in the Army Fuel Laboratory of Japan during World War II. In 1943, he was appointed a lecturer in fuel chemistry at Kyoto Imperial University and began his career as an experimental organic Chemist. He was professor of physical chemistry at Kyoto University from 1951 to 1982, President of the Kyoto Institute of Technology between 1982 and 1988, and a member of the International Academy of Quantum Molecular Science and honorary member of the International Academy of Science. 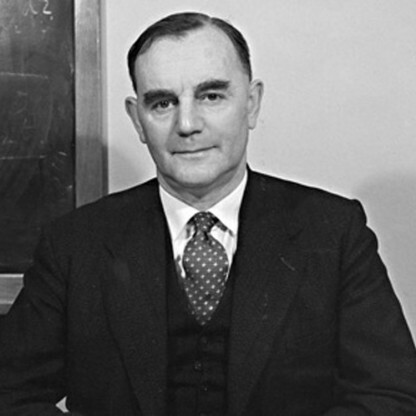 He was also Director of the Institute for Fundamental Chemistry from 1988 till his death. 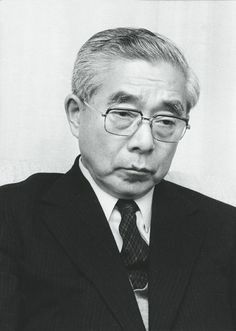 As well as President of the Chemical Society of Japan from 1983–84, receiving multiple awards aside from his Nobel Prize such as; Japan Academy Prize in 1962, Person of Cultural Merit in 1981, Imperial Honour of Grand Cordon of the Order of the Rising Sun in 1988, with many other awards not quite as prestigious. 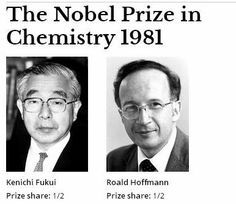 Professor Fukui was co-recipient of the Nobel Prize in Chemistry in 1981 with Roald Hoffmann, for their independent investigations into the mechanisms of chemical reactions. 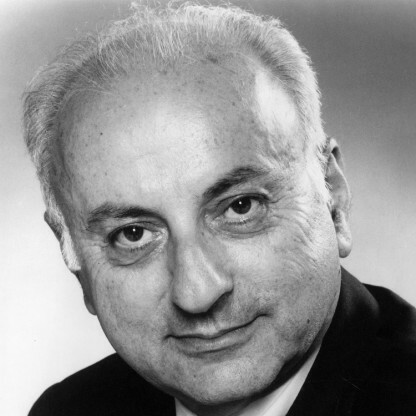 His prize-winning work focused on the role of frontier orbitals in chemical reactions: specifically that molecules share loosely bonded electrons which occupy the frontier orbitals, that is the Highest Occupied Molecular Orbital (HOMO) and the Lowest Unoccupied Molecular Orbital (LUMO). 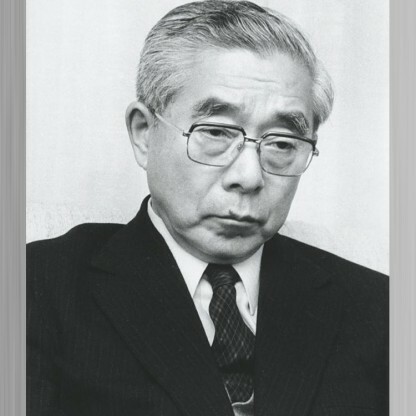 In an interview to New Scientist magazine in 1985, Fukui had been highly critical on the practices adopted in Japanese universities and industries to foster science. 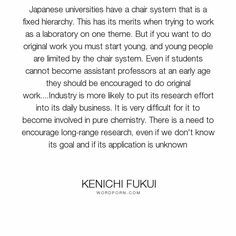 He noted, "Japanese universities have a chair system that is a fixed hierarchy. This has its merits when trying to work as a laboratory on one theme. But if you want to do original work you must start young, and young people are limited by the chair system. Even if students cannot become assistant professors at an early age they should be encouraged to do original work." Fukui also admonished Japanese industrial research stating, "Industry is more likely to put its research effort into its daily Business. 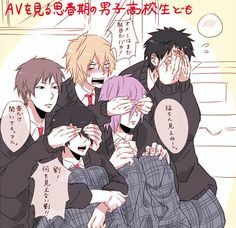 It is very difficult for it to become involved in pure chemistry. There is a need to encourage long-range research, even if we don&apos;t know its goal and if its application is unknown." 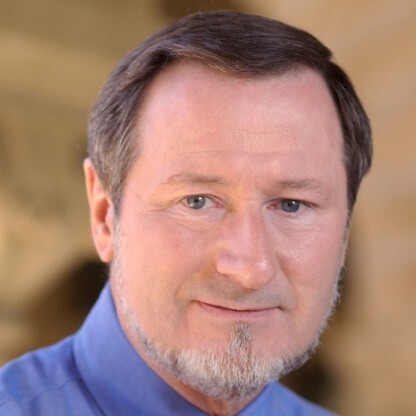 In another interview with The Chemical Intelligencer he further elaborates on his criticism by saying, "As is known worldwide, Japan has tried to catch up with the western countries since the beginning of this century by importing science from them." Japan is, in a sense, relatively new to fundamental science as a part of its society and the lack of originality ability, and funding which the western countries have more advantages in hurt the country in fundamental science. Although, he has also stated that it is improving in Japan, especially funding for fundamental science as it has seen a steady increase for years. 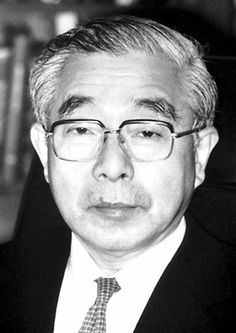 Fukui was elected a Foreign Member of the Royal Society (ForMemRS) in 1989.